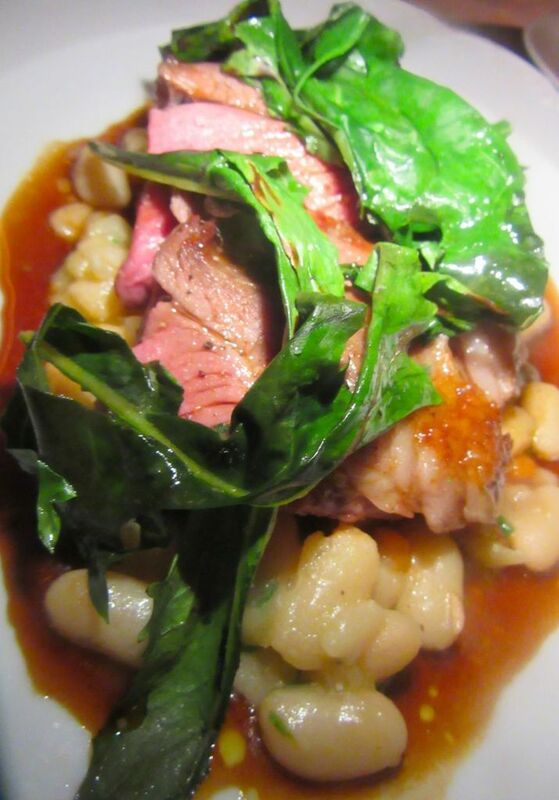 Rare slices of lamb with beans and greens make a lovely plate, but the meat is hard to chew. When have you ever been offered mortadella on a brioche and milk bun? 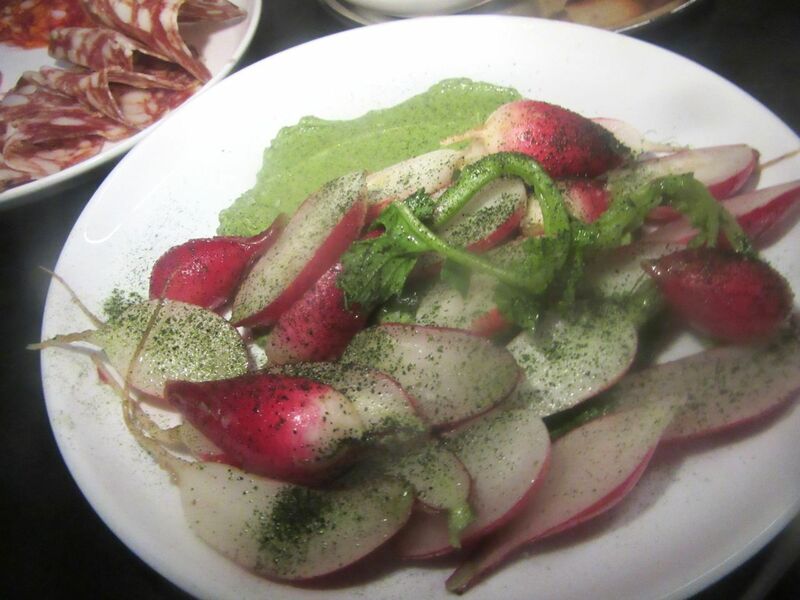 Or celtuce gratin with marrow? Or little rounds of pig’s feet anchored to a sauce gribiche as an amuse? Am I amused? It seems that Frenchette is not quite what I expected it to be. 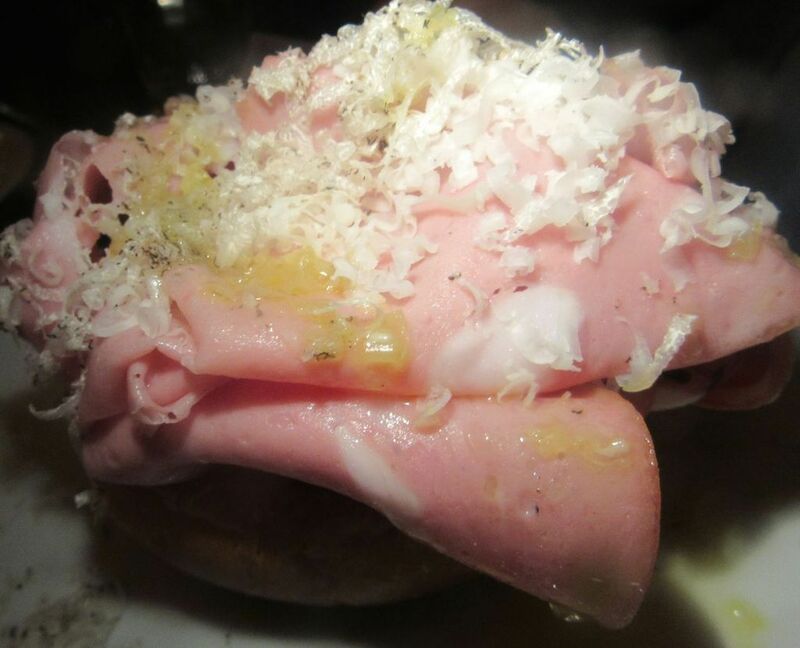 Mortadella piled on a slice of country bread is listed as an amuse and frankly, it is amusing. Some people are afraid of pig’s feet. 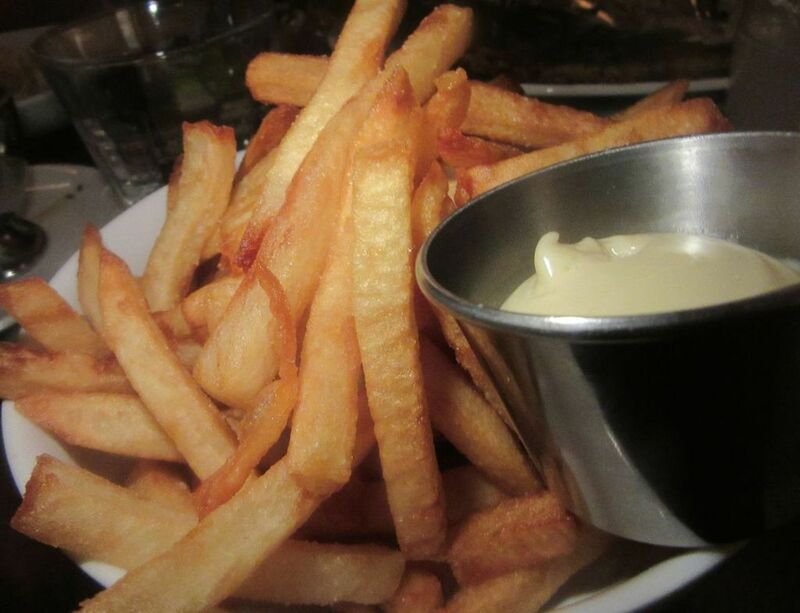 They will like these quick-fried rounds planted in a whipped up gribiche. The menu evolves. It’s slightly different from when we first sat at this same table a week earlier. Peconic escargots and garlic butter replace the nubbins of sea urchin nesting in the sensuous, softly scrambled eggs. Usually my friends are willing to order different dishes and share plates or tastes to honor my research. But tonight two of us must have the delicate scramble. I offer tastes to my pals who chose asparagus, but not with any graciousness. 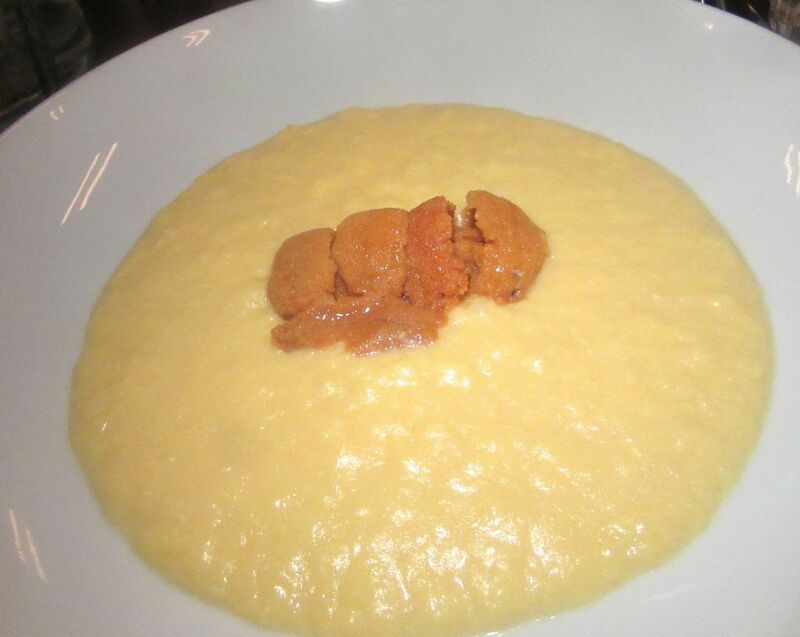 I love these softly scrambled eggs with sea urchin so much, I can only grudgingly share them. 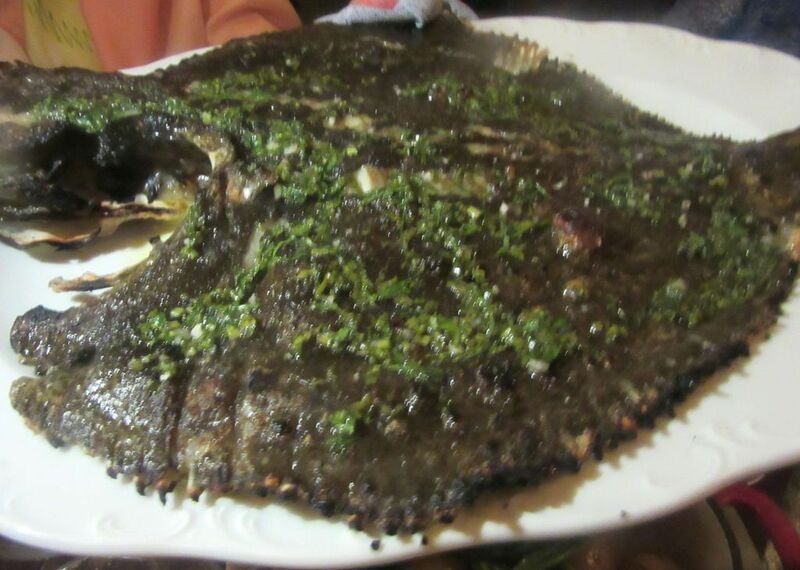 The flying saucer of whole roasted turbot lands on the table ready to be boned and shared by four of us. The whole turbot for two with a bowl of little buttered potatoes lands on our round like a big flying saucer. My companions across the table show off their expertise with marine anatomy. The flesh is moist and sweet and full of buttery flavor. 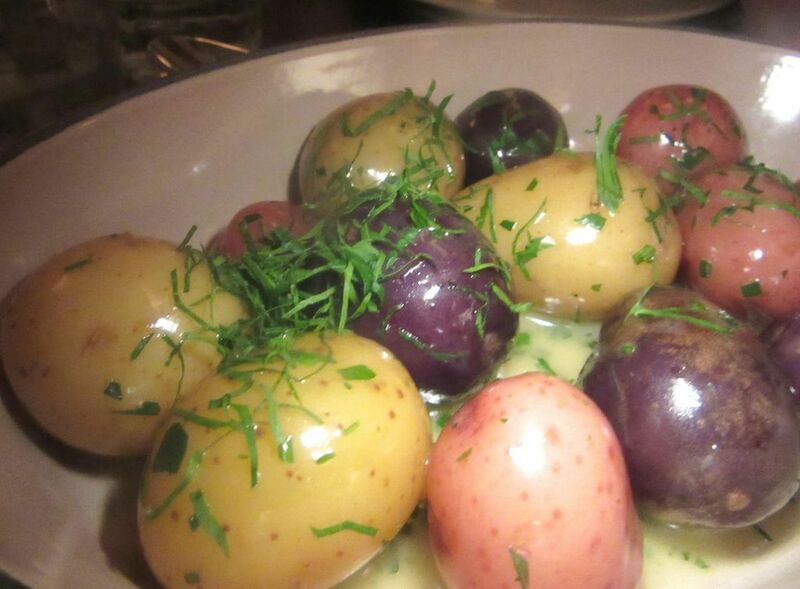 Small whole buttery potatoes in several colors accompany the turbot. 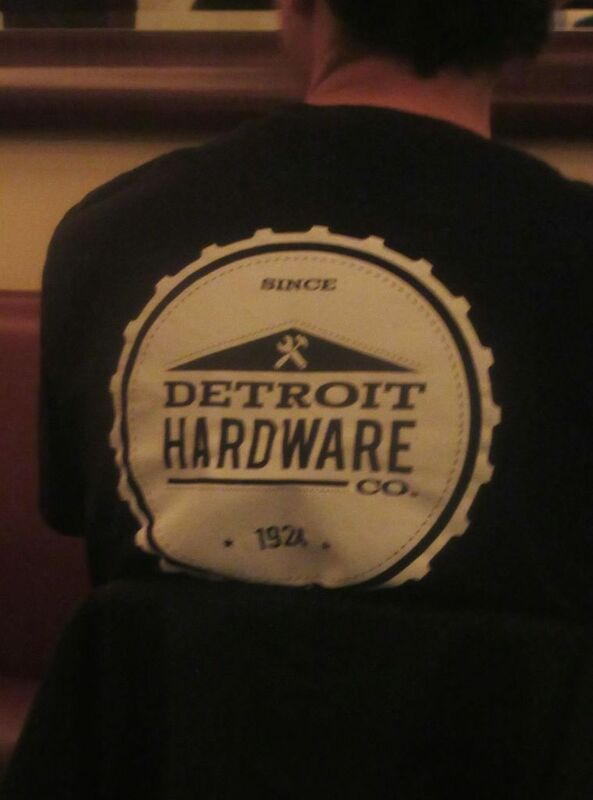 As a transplanted Detroiter, sitting across from this man in the Detroit tee shirt makes me laugh. It doesn’t matter if the boudin blanc is classic and the veal tongue with grilled mackerel tonnato is an invention; in no time at all Frenchette has become the hottest spot in town. “I can’t sit down because everyone I know is here – customers and industry friends. 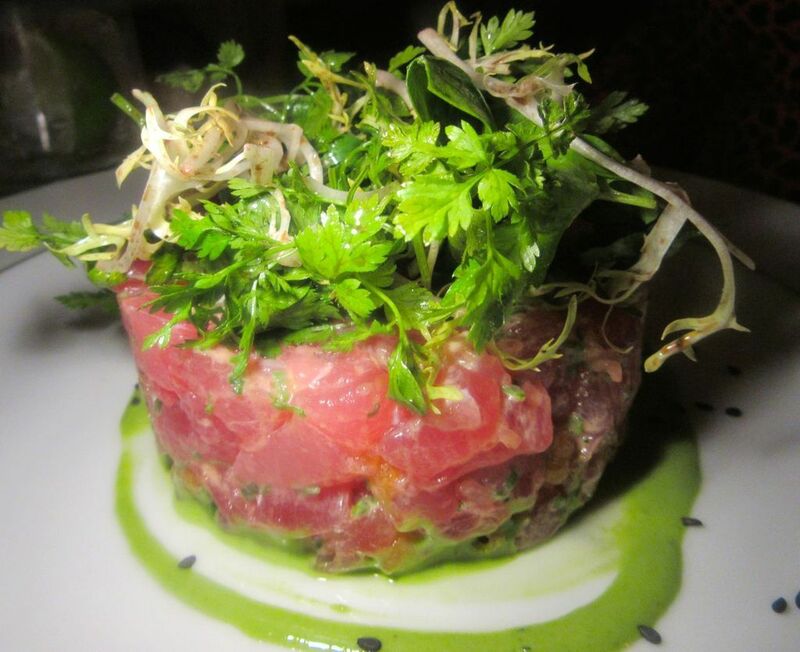 I have to say hello,” cries one of my companions, a restaurateur. 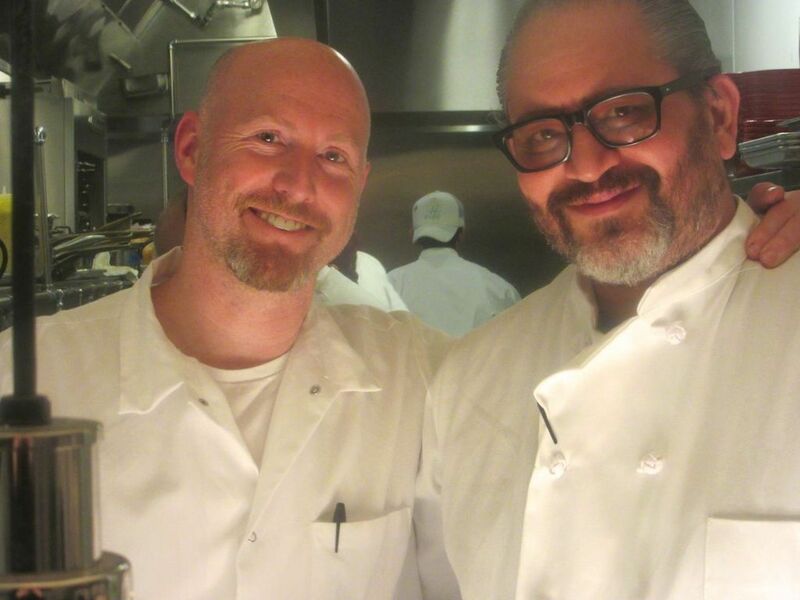 At the end of the Frenchtte’s back dining room is the open kitchen with chefs Lee Hanson and Riad Nasr. 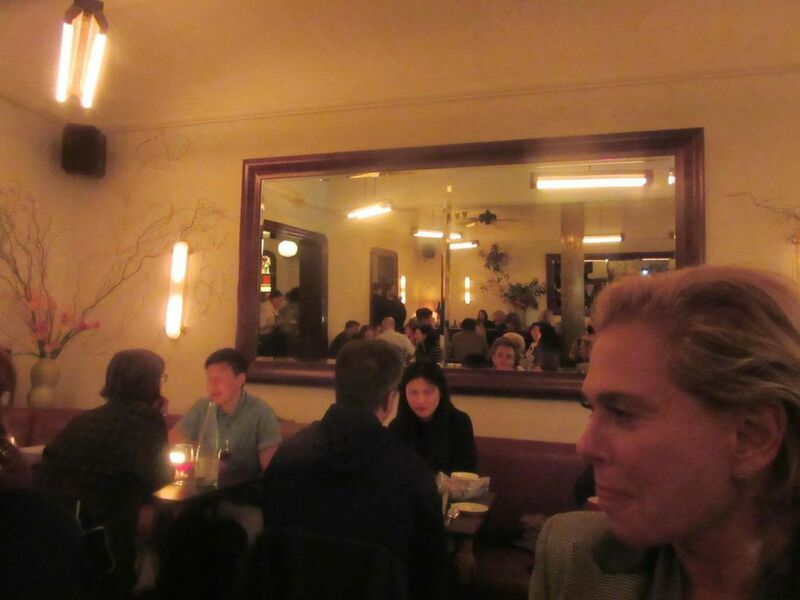 The food world -- eaters and chefs and scribes and fickle nomads -- has been waiting to claim these tables since chefs Lee Hanson and Riad Nasr left Keith McNally’s Minetta Tavern to go out on their own. It’s not important if you want to call it a bistro or a brasserie or a venture in France’s looser, more improvisational bistronomy movement. I never heard of celtus before either. 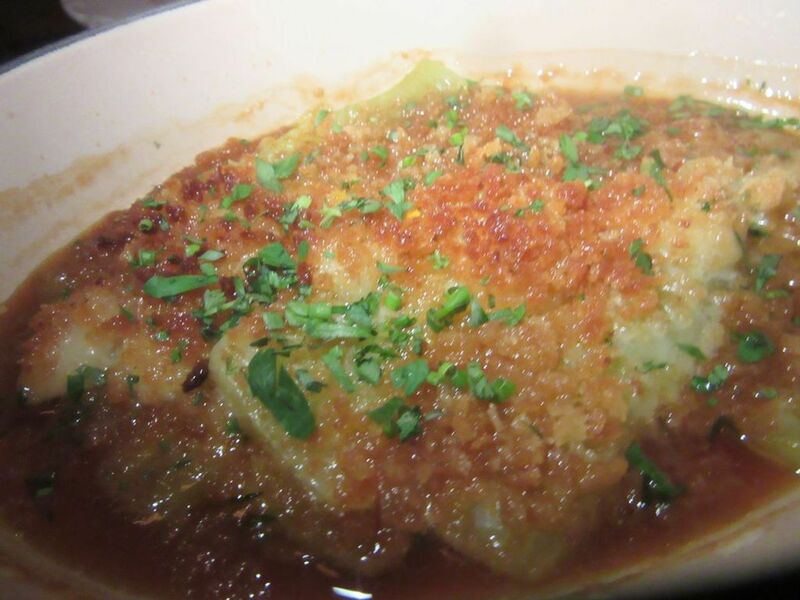 It’s called stem lettuce or celery lettuce, here in a gratin with marrow. It’s as simple as radis au beurre, a whole roast chicken, or a 50-day dry-aged rib eye for two, and as tempting as rotisserie lobster with curry butter fondue or stewed rabbit with morels and house-made egg noodles. Maybe not everything will be as perfect as that turbot. The leg of lamb may be too tough to chew. 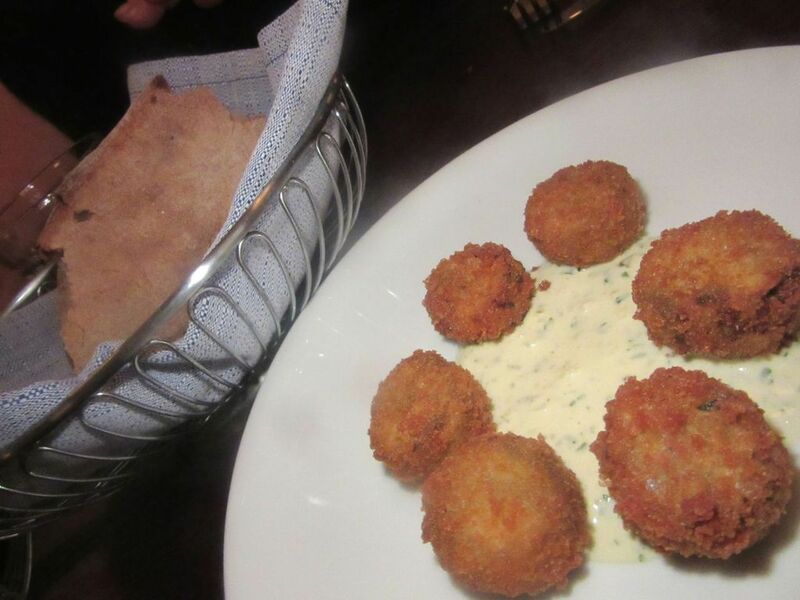 The artichoke tajine may be so boring it gets sent back to the kitchen and dropped from the menu. But we’re already planning to return. The mirrors let you keep track of the action and see the industry types piling in. “I know too many people here tonight,” my tablemate Eddie cries as he returns from greeting customers and friends across the room. It’s true. Frenchette this Thursday is full of people from our industry, faces that are familiar. Dining savants with connections booked far ahead or those without clout pack the bar in hopes someone will recognize their right to graduate to a table. 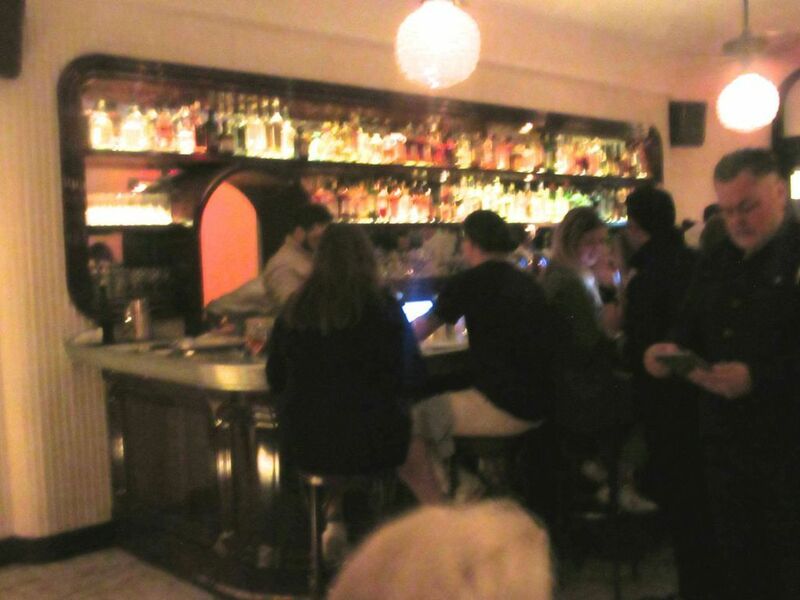 Hopefuls wait at the pewter-topped bar with its Viennese wood frame. Springs Collective did the design. Remembering the scarred mirrors and boiserie of Balthazar where these chefs built their image, I expect more glitz. Not the restrained Viennese curves of the woodwork, the backless bar stools and burnt orange banquettes, the delicate tracery of flowers on dining-room walls. The crowd may be noisy but the look is quiet, like the prices, entrées from $21 up. 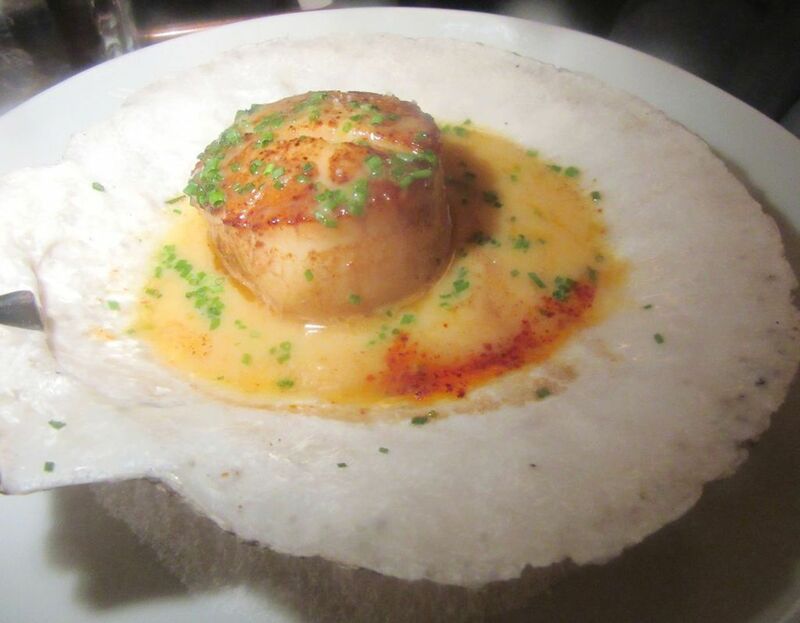 This plump, perfect scallop in its shell is a $14 starter. If you don’t recognize a single name on the wine list, it’s because the cellar created by Jorge Riera, formerly wine director at Contra and Wildair, relies on small growers of natural wines. There are $14 French highballs too, like Calvados and tonic and Pineau des Charentes and soda. This handsome terrine of guinea hen comes with thick slices of country toast, a side of cornichons and mustard. 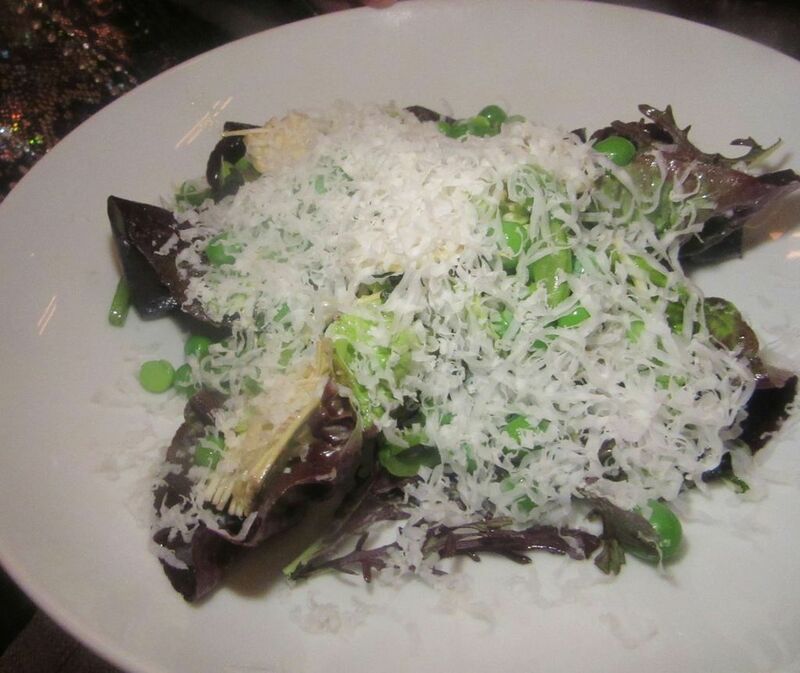 Spring means fresh peas with gem lettuce, artichoke and mint under slivers of goat cheese. 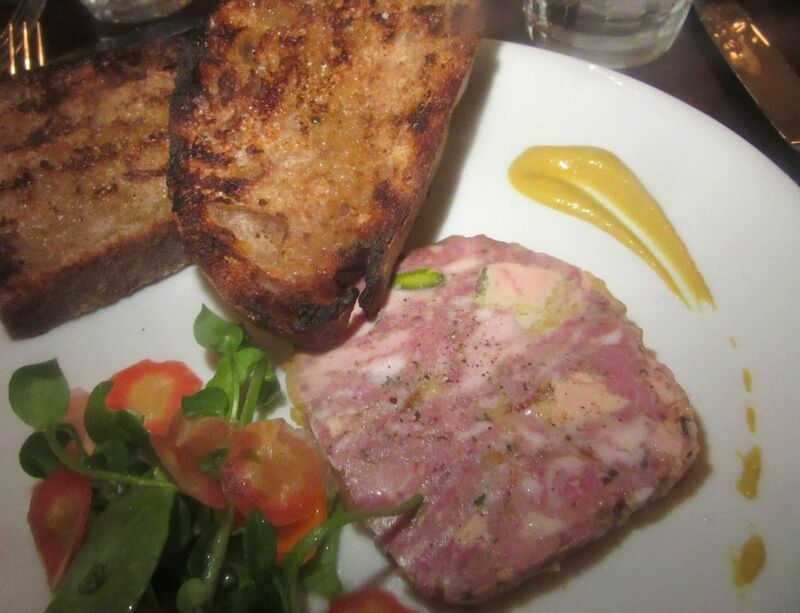 My choice to start on my return outing, the terrine of guinea hen served with cornichons and thick slices of darkly toasted country bread, has replaced the liver pâté with port gelée and rhubarb. It’s wonderful. The celebration of peas is still irresistible, with its flag of fresh mint. One of our group is afraid of pig’s foot, so I get to finish a second scrumptious little round anchored in a whipped-up sauce gribiche. Is it possible? 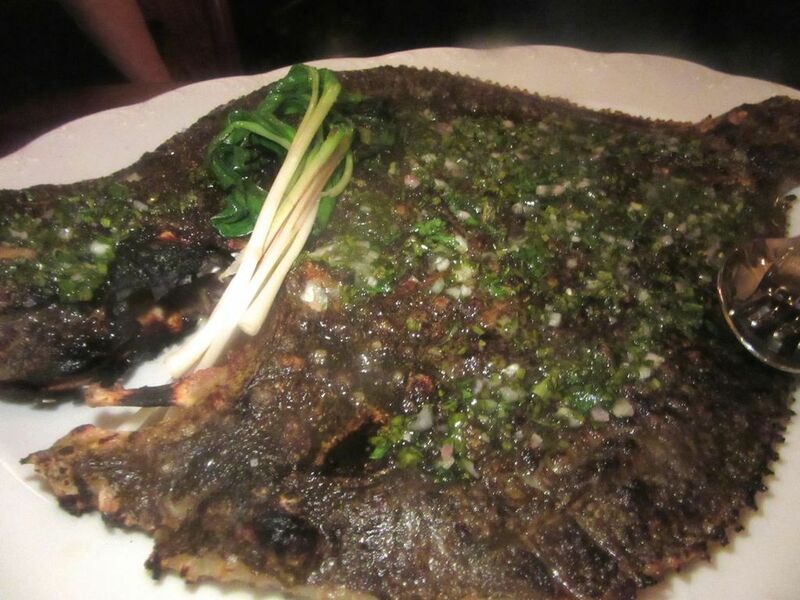 The whole roasted turbot looks even bigger on our second visit. We ask for mayonnaise and ketchup with our side of extra meaty fries. And the giant wing of turbot seems even bigger tonight. The friend who ordered it is especially skilled at extracting every last morsel of flesh from each bone and finds sweet bits from the cheek and throat, enough for all of us to share and more for her to take home. The fries are pleasingly meaty too, and not totally distracting from the small boiled potatoes that come with the fish. 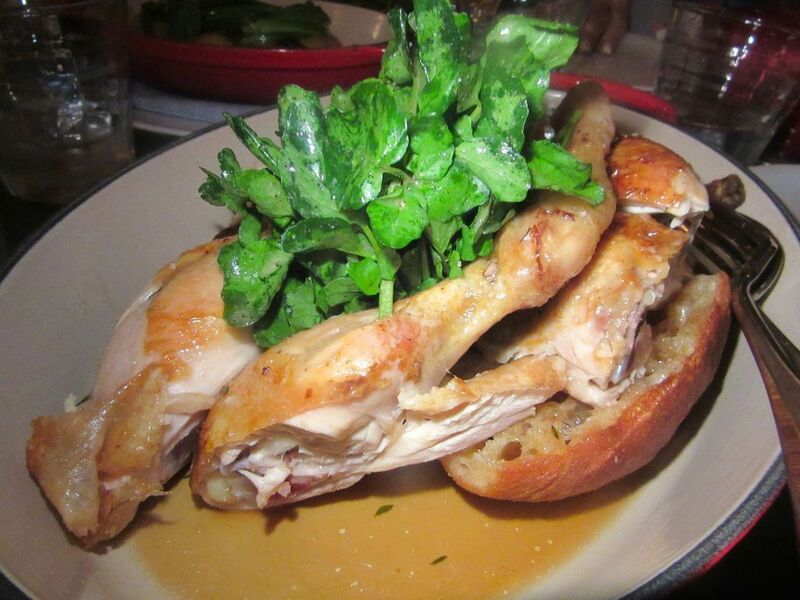 Rich and buttery potato purée topped with maitake mushrooms comes with the roast chicken for two. 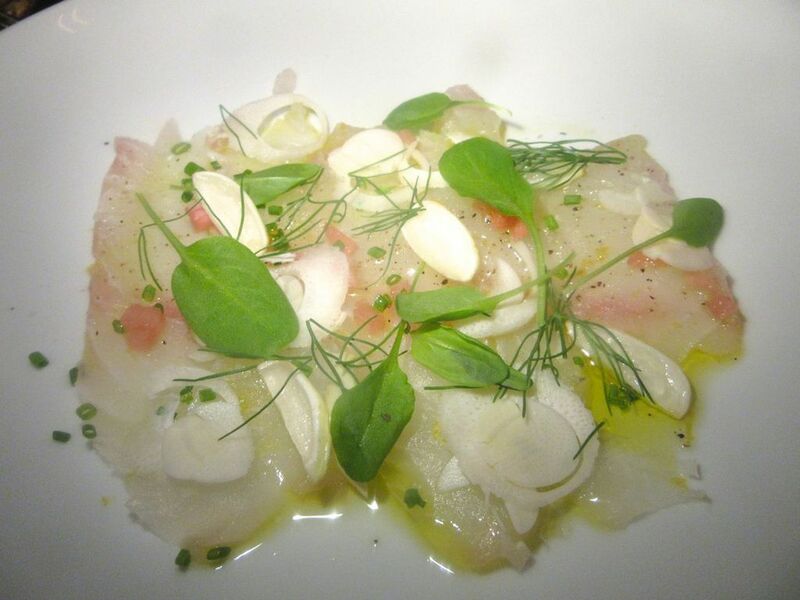 One day the menu might offer be raw scallop; the next this fluke cru with celery and scallion. The house sends this palette au chocolat as a gift. To full for another bite, we ate it anyway. You might feel a bit stuffed just reading this. I sometimes feel full writing it. At the end of both dinners, all of us veto dessert. 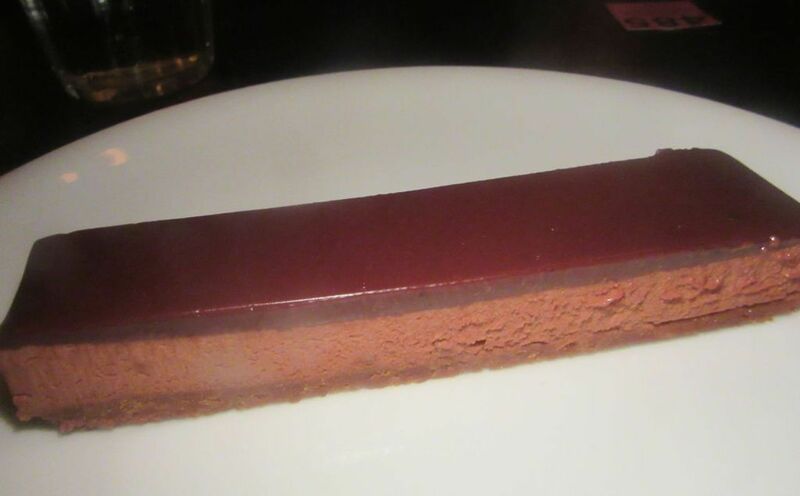 But the server brings a palette au chocolat and the ice cream and sorbet assortment anyway. As I dip my spoon in, it collides with two or three others. The caramel at the end tastes house-made too, meltingly soft, and no threat to cosmetically perfect teeth. 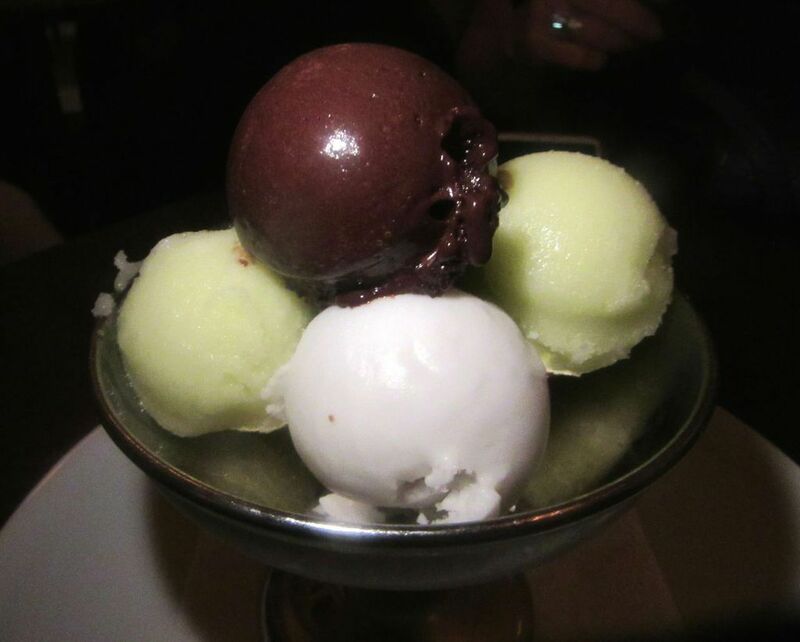 The house’s ice cream and sorbet are piled into a single dish, the perfect finale. I like the idea that this menu will continue to change every day and welcome each new sign of each new season. With a few more weeks of practice, hustling for full houses, I suspect the kitchen will up its game quickly too. I don’t need tablecloths and tuxedoes the way I need scrambled eggs with sea urchin and a glass of red wine I never heard of. 241 West Broadway between Walker and White streets. 212 334 3883. Eventually Frenchette will be open from breakfast on, but for now, dinner 5:30 pm to 11 pm.